Anyone who has ever served in the military or had a family member that has know the importance of the letter from home. They help you with being homesick and letting you know that life is still moving even when it feels like time is standing still. I received my son's bootcamp address yesterday. 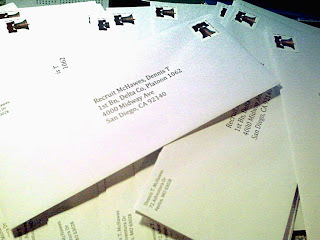 I have already dropped one letter in the mail and have printed numerous envelopes to be soon filled with letters. If you are reading this, take the time to drop him a line. As to all of my old Jarhead buddies, many of you have not see Denny since he was a baby in 29 Palms. However, I know that he would get a kick out of hearing from some old Leathernecks and telling him to stay motivated. This is the picture of the day.